Strengthen your immune system and fight off the seasonal symptoms of hay fever with probiotics! Hay fever season is just around the corner. It usually occurs in Spring, Summer and early Autumn. In Ireland, most people who suffer from hay fever are triggered by grass pollen, however, it can also be caused by tree and weed pollens as well as mould spores. Most people with hay fever have symptoms which include a runny nose, itchy eyes, mouth or skin, sneezing, nasal congestion and feeling tired. Antihistamines, decongestants and eye drops all help with the symptoms of hay fever, however, recent studies have also revealed that those who supplemented with probiotics have experienced a reduction in allergy symptoms and a better quality of life. Bio-Kult Advanced is a multistrain probiotic which contains 14 different strains of healthy bacteria. These support the entire digestive system from mouth to gut. Bio-Kult Advanced contains the perfect blend of healthy bacteria which can help prevent and treat hay fever. Lactobacillus Casei has been shown to reduce the immune response in hay fever and also beneficially alter the balance of pollen-specific antibodies in the blood which can lead to a reduction of symptoms. It also contains Bifidobacterium Longum this probiotic can greatly help the immune system. This probiotic is also involved in reducing the number of antibodies that we produce in relation to pollen allergies. Udo’s Choice Super 8’s contain a blend of 8 different strains of healthy bacteria which support the entire digestive system from mouth to gut. Each capsule contains 42 billion good bacteria which are guaranteed to survive passage through the stomach acid. 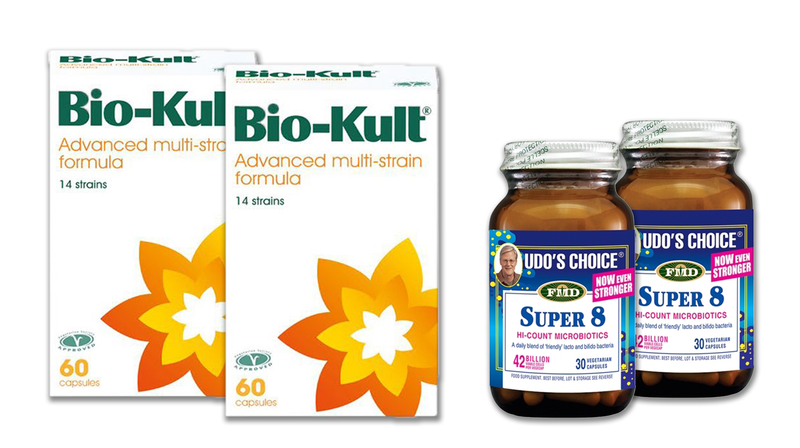 Udo’s Choice Super 8’s is perfect to support the immune system. And also can help reduce the severity of hay fever symptoms. The optimal time to start taking probiotics for hay fever, and in particular these specific strains, is one month before pollen season, during and for one month after. This will help to modulate the immune response and can result in the lessening of symptoms. Taking your daily dose of probiotics will also help as a preventive treatment stopping hay fever in its tracks.